This large work by Bob Rankin is particularly nice. I acquired it from him in late October 1998, just before my sister Lee's wedding. The main image is of waves crashing in the ocean. Below and to the right, there are three vignettes which show a seaside scene... as the vignettes proceed to the right, they are covered progressively by the main image. The rectangle in the upper-right corner is produced by layering gel media over the main image, thereby producing a transparency effect. Finally, there is a rod, painted over the main image. The rod casts a "shadow" on the main image... this was produced by actually suspending a rod in front of the work and shining a light on it. The shadow was then painted where the actual shadow fell. The presence of the rod adds tension to the work, according to Bob... I just think it looks cool. 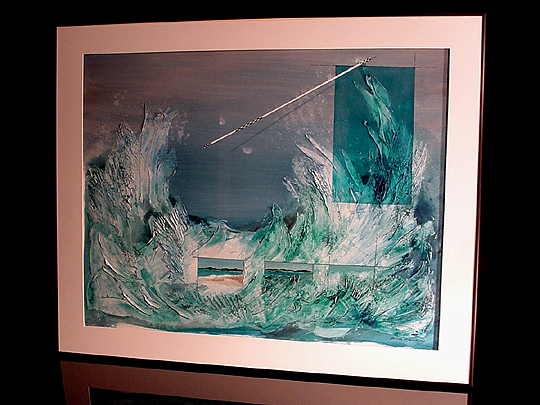 This work is called Solo Surf Surface because it is unique among Bob's Surf Surface series... specifically, the black hash marks on the rod do not appear on any of his other works. This work was entered in the jury show at the 1998 North Carolina State Fair. Bob has painted a series of these works, and they have proven to be very popular with his other clients. I really like mine.